divide the types into five categories. Square—Forehead, jawline and cheekbones are almost equal in width. 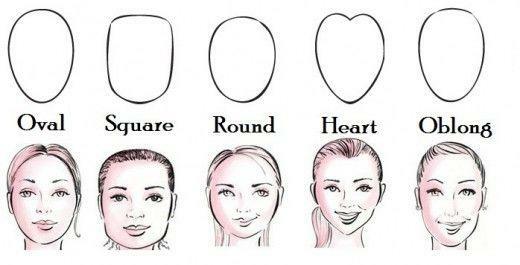 Round—Wide hairline, wider and fuller cheeks. Heart—Wide forehead and temples, narrow jaw and pointy chin. Oblong—Long narrow bone structure, often accompanied by a thin, long neck. As you may have known your face shape, it’s time for the hairstyle talk now. straight, it doesn’t matter. So feel free to experiment. The biggest pop star Rihanna is known as a hair chameleon. Here we can see a photo of her hairs below. has changed her hairstyle for like a million times but never failed. short wavy, medium straight, and long wavy or even a simple ponytail. actress Taraji P. Henson is an representative example of square faces. Here is the picture of four hairstyles she rocked best. asymmetrical side cut can streamline a broad jawline. illusion of a longer face and add softness to the face. hide the wide chin and balance the shape in a better way. although your original goal is to want your face look narrower. Chin-Length Bob – Blunt, chin-length bob with side part will draw attention to her beautiful eyes and elevate her cheekbones. with layers can make face look slimmer and soften the face texture. face, add more angles to the face, and give it a flattering look. longer, slimmer face,with side-swept bangs is a plus. There is no better example than Kerry Washington that can think for having a heart shape face. Short Cut with Bangs – Short cut can highlight your chin and jawline.Blunt bangs perfectly hide your wide forehead. Medium Curls with Side Bangs – Medium curls with side bangs bring movement around the face and balance the face features. When we are talking to oblong faces, we cannot mention singer Kelly Rowland. Here are 4 types of hairstyles that suit her best. Bob with Blunt Cut Bangs – Short jawline bobs can draw attention away from the length of face, and the blunt cut bangs. flattering, and it is a good way to round out the shape of face. fringe really helps to widen the face and adds softness to the face. whatever you want with your hair to look cooler and more characteristic.